From Emerald City (that?? ?d be Seattle, WA) comes this interesting use of digital manufacturing technology to give a new lease on life to reclaimed timber doors. Husband and wife team Jonah and Mackenzie Griffith together form Object Creative, a design house that specialises in bringing humour and simplicity to fully functional design. The reDoor project takes traditional domestic doors that have been reclaimed through salvage, and extends their lifecycle. 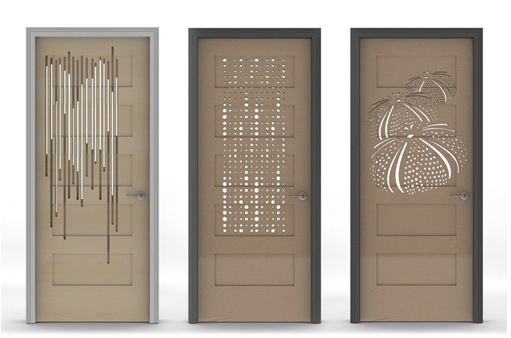 The magic happens when a CNC router is used to cut designs and patterns into the wooden doors. A little lacquer and a lick of paint later, and you have a portal that is sure to be the envy of all your neighbours. There?? ?s a touch of the mesmerising look we saw with smArchitecture here, although this time around it is much more accessible to everyday folk like you and me.